Just because some games release and score poorly at mainstream outlets doesn't mean they're terrible all the way around for every kind of gamer. Two recent releases actually managed to score pretty high with disabled gamers on the D.A.G.E.R. System, or the Disabled Accessibility for Gaming Entertainment Rating System. Most gamers will know that The Bureau: XCOM Declassified was absolutely destroyed by most major gaming outlets for a number of reasons, including a poor story (which seems odd given that X-Com never made its fame based on story) and dated graphics (another feature that the original X-Com was never known much for anyway). However, despite the shortcomings that gaming media laid out for XCOM Declassified, it actually managed to score quite high – or pretty much garner a perfect score – on the D.A.G.E.R. System. Whether 2K Marin intended for it or not, but the game scored “Barrier Free” marks across the board, meaning that those with some form of visual impairment that prevents them from clearly seeing colors won't have any inhibitory features to struggle through, as the game uses lots of “easily readable symbols” and non-color defined markers. Those with auricular impairments will also find that there are plenty of on-screen cues and subtitles to help out as well, so it's possible to easily follow the story and the on-screen action without relying too heavily on audio cues. Giving gamers of various disabilities options with audio and visual variances is something that was rated quite highly on the D.A.G.E.R. System. The game's use of slow-motion also helped for those with motor precision impairment, so disabled gamers lacking in quick reflexes will still be able to pump out some mean strategic gameplay combos thanks to certain other elements in place to make up for fast-precision reactions on the player's end. Even though many sites railed on The Bureau, it at least seems to be disabled-gamer friendly. Rayman Legends has a bit of a different story to tell than The Bureau, mostly because other gaming sites did give the game some solid review scores for being a good game overall. D.A.G.E.R. System ran it through their review list and managed to come out with some fairly decent rankings. The game overall ranked as “Thoroughly Accessible” and was not quite “Barrier Free” like The Bureau, mostly because of the fine-motor skills required to do some of the more challenging platforming aspects and the precision-based gameplay that permeates the platforming. The D.A.G.E.R. System reviewed the Wii U version of the game and noted that the Gamepad is a blessing and curse due to its ability to make platforming easier with the touchpad, but the lack of control customization proved to be a feature that could make it difficult to use for some disabled gamers. 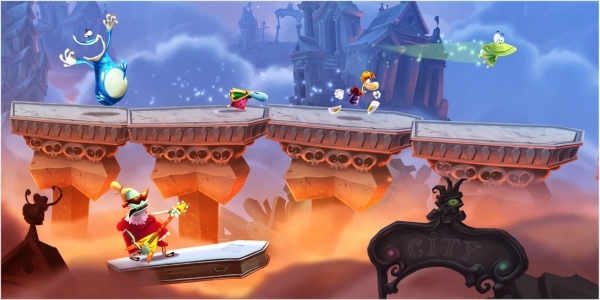 Rayman Legends also managed to score high marks for its visuals and audio, getting the “Barrier Free” ranks since gamers who are color blind wouldn't run into problems and the same was said of the audio features as well. Both The Bureau: XCOM Declassified and Rayman Legends are available right now for home consoles and PC.